Heat oven to 400 degrees F. Either line a rimmed baking sheet with foil or spray the sheet with no-stick spray. Combine the sugar, chili powder, 1/2 tsp each salt and pepper. Rub pork with spice mixture and transfer to the baking sheet. Roast until internal temperature is 145 degrees F, 18 – 22 minutes. I prefer non-pink pork, so I roasted the meat for about 40 minutes. Your choice. Let pork rest for at least 5 minutes before slicing. While pork cooks, whisk together the lime juice, olive oil, 1/2 tsp each salt and pepper in a large bowl. 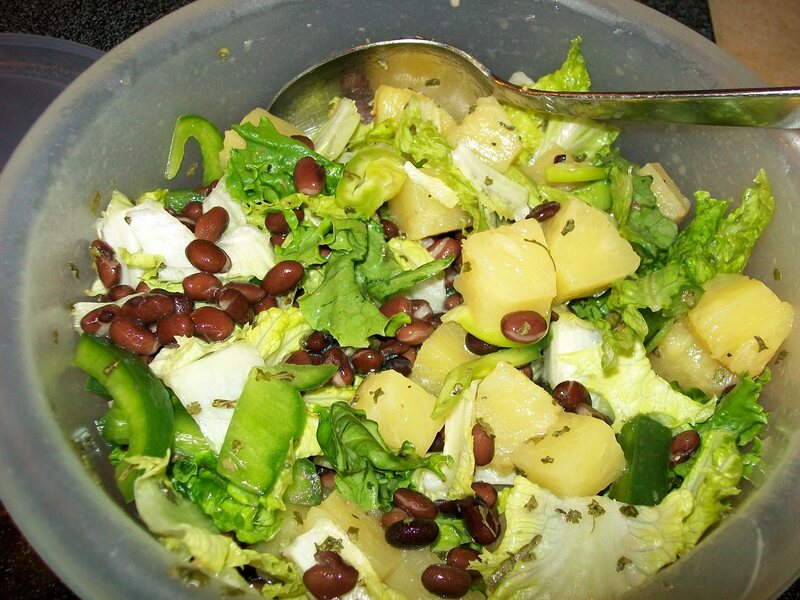 Add the beans, pineapple, bell pepper, jalapeno, cilantro, and lettuce. Toss to combine. Slice pork tenderloin into half inch slices. 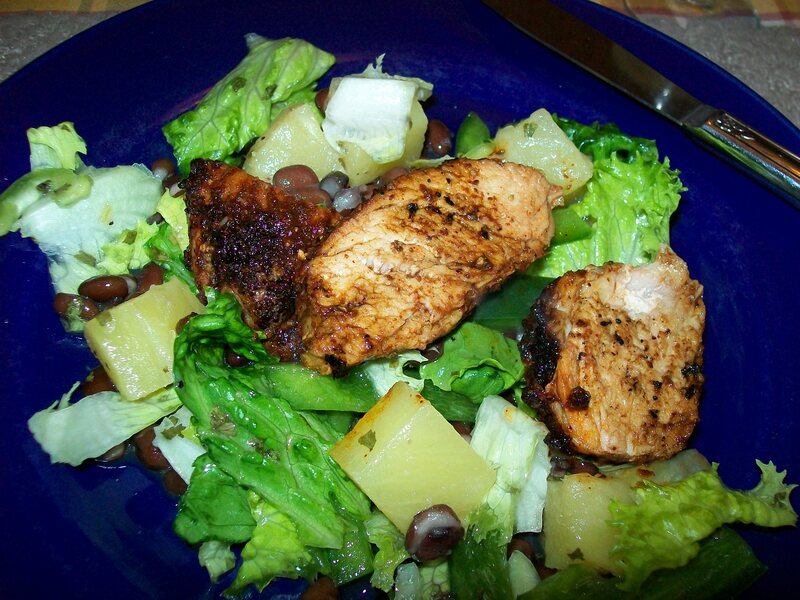 Place pork on top of salad mixture. Leftover salad (if any) is even better the next day. Don’t overlook “mundane” reads such as Women’s Day. They actually test their recipes, unlike some food mags. Until next time, happy scrounging! 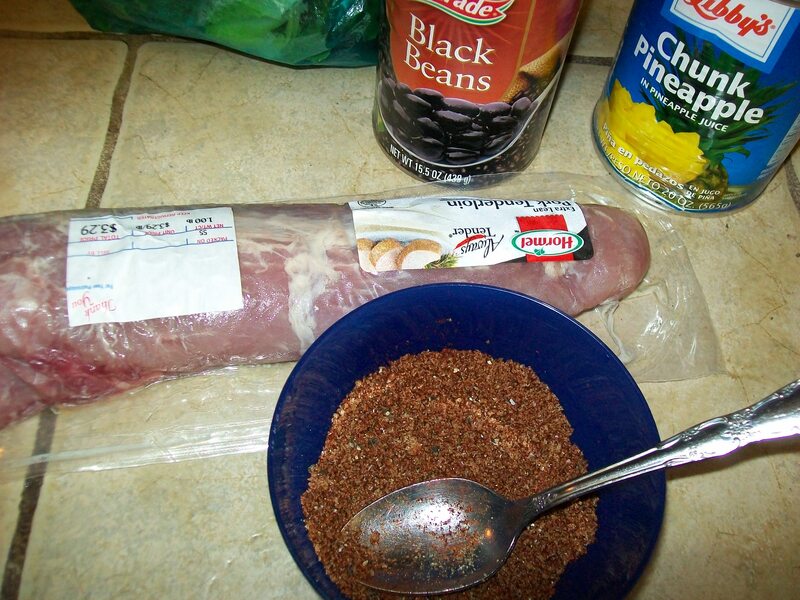 Nice… I love the addition of the black beans! I’ve got about 50% of these things – so If i decided I wanted to make I’d head out with a list and come back with the things on it plus about 30 other things I never intended getting – sucker! Yummy! I like to keep ancho chili powder on hand too. Am always amazed how versatile it is! It is also very true (and unfortunate) how many food publications and well-respected newspapers (NYT . . . I’m looking at you!) don’t test their recipes out before they publish them. I didn’t know that Women’s Day did. I have a new respect for them now! 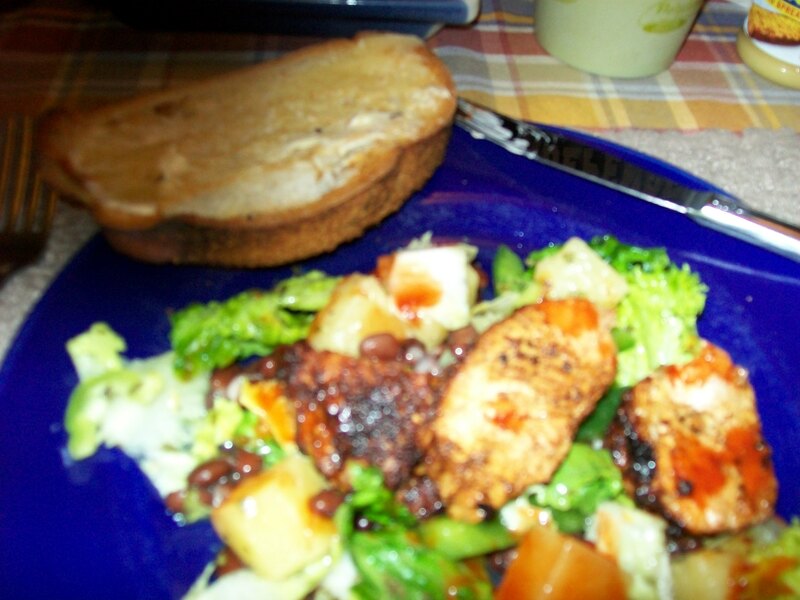 Ancho chili powder provides chili flavor without the heat. You can tell someone isn’t checking when ingredients are listed but then never make it to the instructions. And proportions can be off, or the author confuses weights with measures. I used to test quantity recipes – it takes much careful work to produce a recipe the average cook can follow. Yes, NYT is guilty! Thanks for noticing.